Our regular meetings begin prompt at 6pm, on the third Wednesday of the following months – January , March, April, September and November. Morning dress, or dark lounge suits with black shoes and tie, white shirt and white gloves, should be worn.All officers should be aware that unless they advise the Dining Steward to the contrary by the previous Thursday, they will automatically be booked in for dining after the meeting. If you would like to book in guests you can use the form opposite to do so. Every Brother elected or appointed to an office, shall, by his acceptance thereof, be considered as pledged to a strict performance of the duties attached thereto, and a regular attendance during the period for which he shall be so elected or appointed. Officers unable to be present at the opening of the Lodge are requested to notify the Secretary as early as possible, so that the necessary arrangements may be made for other Brethren to fill their offices. Our Installation meeting takes place at 3pm sharp on the third Wednesday in October. All officers will be attired in Evening dress, all other brethren and visitors should be dressed in Morning dress, or dark lounge suits with black tie and shoes, white shirt and white gloves. 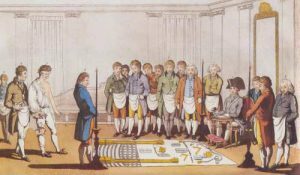 The Loyal and True Lodge of Instruction (L of I), meets on every second and fourth Thursday at 7pm between September and April. For those brethren who are in office or new brethren, every effort should be made to attend. If this is not possible please contact the Director of Ceremonies as soon as possible. Our next meeting will be held on Wednesday 17th April 2019 at 6pm. 2025 Festival tour begins in Dover, keep an eye out, as it is coming to a centre near you soon. The post 2025 Festival tour begins in Dover appeared first on eastkentfreemasons.org. , Worshipful Brother Ron Reveley of De Shurland Lodge receives his certificate for celebrating 50 years continuous service in Freemasonry. The post A Celebration of 50 Years in Freemasonry appeared first on eastkentfreemasons.org. East Kent Provincial Clay Pigeon Shooting Club, Province of East Kent v Province of Essex, Sunday 14th. April 2019 The post East Kent Provincial Clay Pigeon Shooting Club Province of East Kent v Province of Essex Sunday 14th. April 2019 appeared first on eastkentfreemasons.org. It was down to Margate last Friday for the Provincial Craft Meeting, and launch of the 2025 Festival. The post PROVINCIAL GRAND LODGE, 12th APRIL 2019: AN OBSERVER’S UNOFFICIAL REPORT appeared first on eastkentfreemasons.org. Copyright © 2017 Loyal and True Lodge No 4050 - All rights reserved!